The Eta Carinae Nebula is a giant nebula 9000 light years from us in the Sagittarius Arm of the Galaxy. Although it is a large distance from us, the central region of this nebula is bright enough to see with the naked eye (although only from equatorial and southern latitudes on Earth). The vivid colours seen in pictures of nebulae usually only appear on photographs, the human eye is not very sensitive to dim colours, and so with the naked eye a nebula such as the Eta Carinae Nebula only appears to be white. The Eta Carinae nebula is classified as NGC 3372, it covers about three degrees of the sky which at a distance of 8800 light years corresponds to a diameter of about 460 light years. Two other nebulae have been added to the list below, but they are probably neighbouring nebulae not connected to the Eta Carinae nebula. They have very uncertain distances but they are probably also in the Sagittarius Arm. NGC 3199   10 17.4  -57 55  283.6   -0.9    22'   E     7000? 45? NGC 3503   11 01.3  -59 51  289.5   +0.1     3'   E    10000? 10? 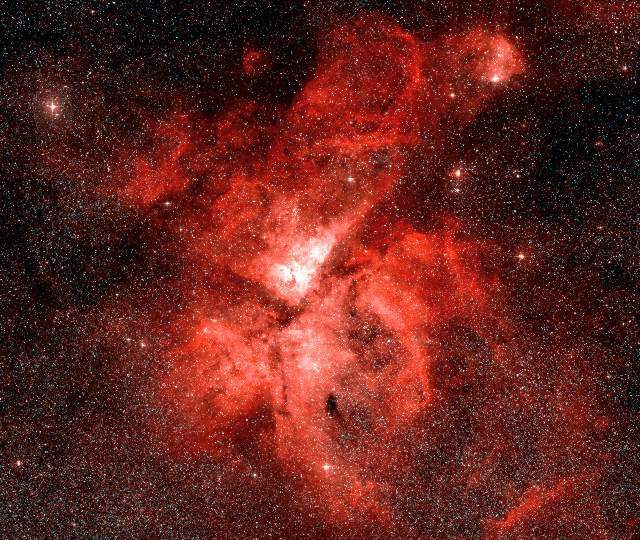 There a lot of star clusters in the vicinity of the Eta Carinae nebula. Many of them are probably foreground clusters in front of the nebula. Two of these clusters are definitely within the nebula - Trumpler 14 and Trumpler 16. Trumpler 16 includes the star Eta Carinae as one of its member stars. Below is a map of the star clusters and nebulae in the region of the Eta Carinae nebula. The Eta Carinae nebula is a large complex nebula with many recently formed stars within it. 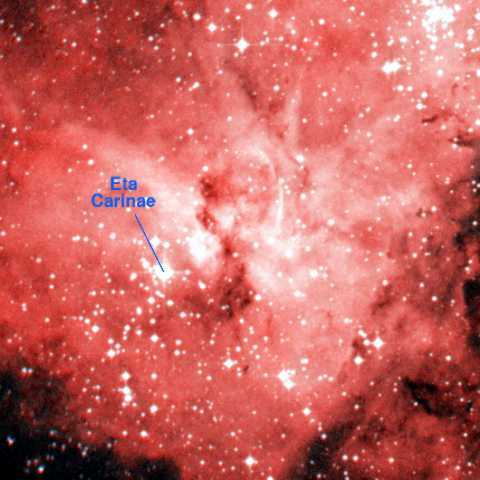 To the left of the Eta Carinae nebula is a second much fainter (and possibly more distant) nebula around NGC 3503. The name NGC 3503 however, only refers to a tiny bright patch of this nebula. The distance to the Eta Carinae is known fairly accurately because there are two star clusters buried at the heart of the nebula (Trumpler 14 and Trumpler 16). The nebula is about 8800 light years away and lies in the Sagittarius Arm. The Eta Carinae nebula is an example of the type of giant nebula which could be seen from far above the Galaxy, hundreds of thousands of light years away. The reason why most bright nebulae are red is because they consist mostly of hydrogen. When hydrogen glows, it emits bright red light. This graph, below, shows the intensity of light from the Eta Carinae Nebula. It is a typical emission nebula spectrum. The strongest emission comes from the red hydrogen-alpha line (at 656 nanometres) although hydrogen also emits some weaker blue light (these are the hydrogen beta, gamma and delta lines at 486nm, 434nm and 410nm). The only other important optical emission is due to the presence of oxygen - these are the two [OIII] lines at 501nm and 496nm. In planetary nebulae this can often be the strongest source of light and it gives some planetary nebulae a characteristic blue-green colour. References: Hua C, Llebaria A, (1981), Optical Spectrum of the Filamentary HII Region North of the Carina Complex. Astron and Astrophys, 94, 12. At the heart of the Eta Carinae nebula is one of the most remarkable stars known. 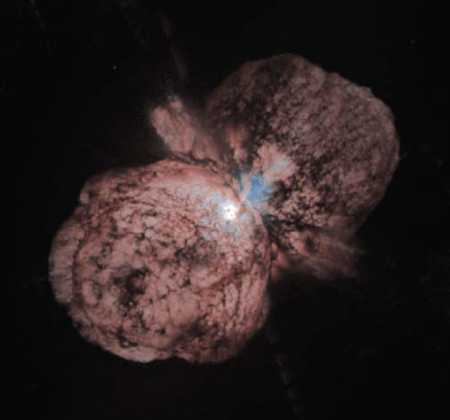 Before 1840, Eta Carinae looked like an ordinary naked eye star. In 1840, it began to brighten and by 1848 it had become the second brightest star in the sky. It slowly faded again, and by 1880 it was below naked-eye visibility. In the picture below, the star, Eta Carinae, is shown. It lies next to the 'Keyhole nebula', a dark nebula with a keyhole shape, although it seems likely that the keyhole was darker in the late nineteeth century when it was first named. The star Eta Carinae does not look spectacular although it has brightened slightly since the late nineteeth century and it is now at the limit of naked-eye visibility. The Keyhole Nebula. Image size: 0.25°x0.25°. DSS image. Eta Carinae is a supermassive star. It may, actually, be two supermassive stars, very close to each other, with a mass of about sixty or seventy Suns each. The image to the right is the best photograph of it taken with the Hubble Space Telescope. The star (or stars) lies at the centre of two expanding globules of dust and gas which were ejected during the 1848 eruption. The dust makes the star look dimmer than it actually is. If we could put Eta Carinae at the same distance from us as the Sun, then it would be about five million times brighter than the Sun.